Raise Money for Your Octopit! Raise Money to Buy the Best Gaga Ball Court on the market, the Octopit! We believe the Octopit is the best gaga ball court on the market because not only is it sleek looking, it is extremely durable with heavy duty steel legs and reinforced polyvinyl side rails. The Octopit features an easy to install design that takes only ten minutes! We also offer customizable dimensions for this top quality portable gaga pit. This is the best gaga ball court on the market and your group will never want to stop playing! A fun way to introduce the game of gaga ball to your community AND a great way to raise money is to throw an Octopit USA gaga ball tournament! 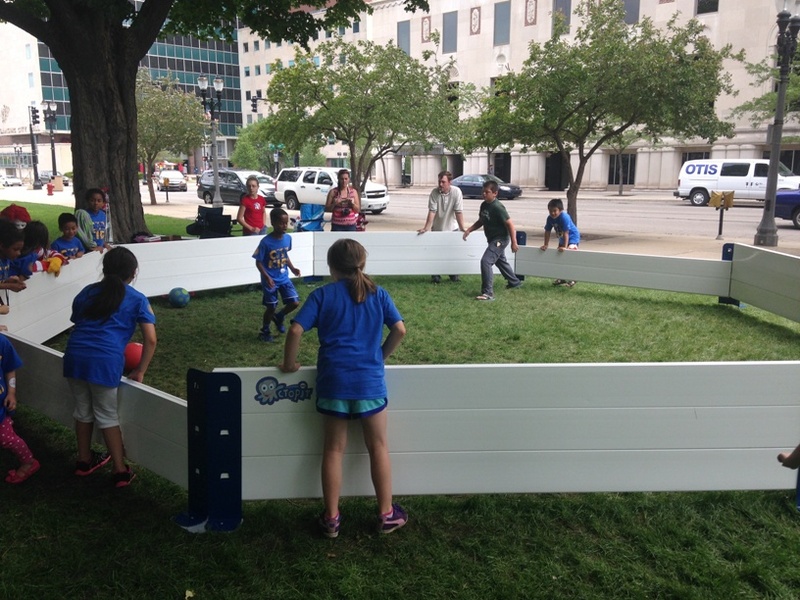 Put the fun in fundraiser with Octopit USA’s highly rated portable gaga pit. With a day full of dodging, jumping and running, watch the excitement level of your organization and community quickly grow! Raise thousands of dollars for your group, organization or community and have a blast doing it together. Don’t miss out on the fun any longer! Order a Octopit USA gaga game pit today!